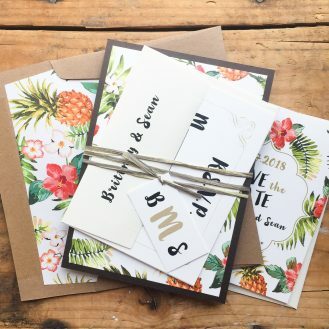 "Everyone LOVED the invitations they were beautiful and they received several compliments. Thanks again for everything you were so easy to work with and everything about the process was quick!" 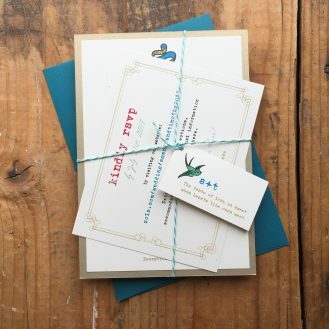 "Everyone loved the invitations - they really exceeded expectations, and I received so many compliments. 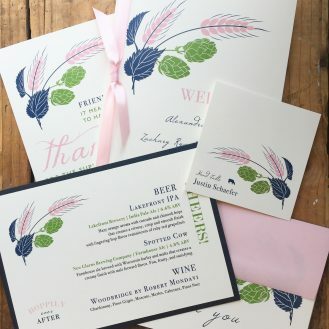 Best, Samantha"
"Received the invitations last night, they look AMAZING! Thank you very much for creating awesome designs, and being always on time! Looking forward to working with you again! -Kind regards, Jansu"
"I loved everything about the process of working with you and Beacon Lane. The website is very straightforward about how to order and what options each item has that you can customize. It was really helpful to me to see all the samples on the website! Within a week of ordering wedding invitations and other wedding stationary the proofs were sent to me to ensure everything looked perfect. Communication about changes to my order and sending my order to print were very fast! I was also surprised with how fast they shipped! Within a few days of sending the items to print they were shipped to me, and were at my door in about two days! There was not one misprint/oddity in the 200+ things I ordered. 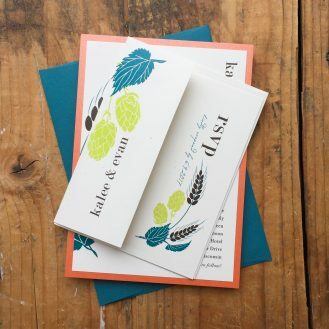 I love the unique design of the Hops Love and definitely recommend the company to anyone who wants wedding stationary that is carefully created! 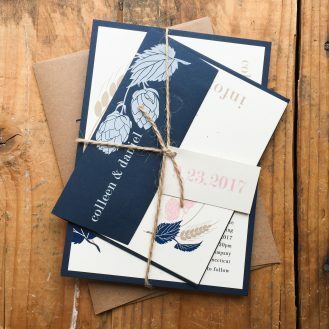 We haven't had our wedding yet, but I know our guests will love the hops design of the ceremony programs and name cards and how they coordinate with our invitations :) Thank you so much for your help and assistance through this process. You made things very easy for me! -Take care, Kalee"
"Beacon Lane was FABULOUS to work with. 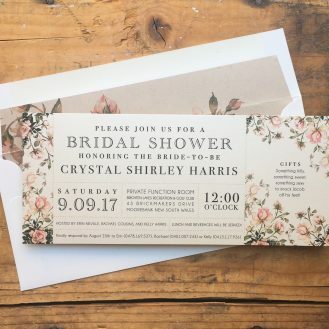 I spent hours upon hours researching invitations and styles to make sure what I ordered, and who I ordered them from, fit the vision of my wedding. Living in the Bay Area I was constantly running into styles that were stylish and chic, but well out of my price range. When I found Beacon Lane I hit the jackpot! 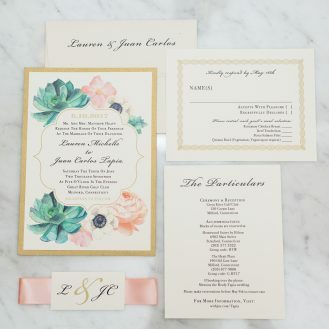 The blush floral liner coupled with the stunning Modern Calligraphy font is just what I envisioned for my Napa Valley wedding! My calligrapher LOVED the liners too! 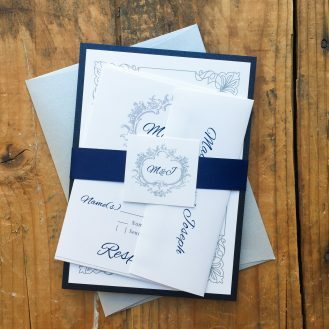 I’ve sent my friends and family a “sneak peek” and everyone has loved them – I can’t wait for them to start arriving in our guests mailboxes soon! -Megan B." 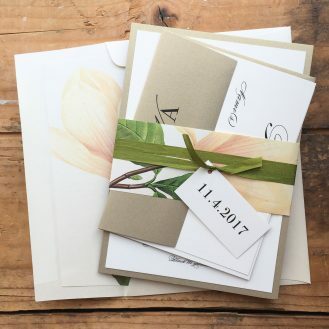 "Everyone LOVED the invitations! Thank you for getting hem to us so quickly. I will contact you in the future for invitations. Thanks, Jess"
"We were so pleased with the finished product! I got loads of compliments from my guests about the invitations. They were tasteful and romantic and fit the tone of our wedding perfectly. I was also very happy with the responsiveness of our consultant, Jess, and the attention to detail that she paid to our drafts. She even came back with a few suggestions to make our wording more clear and took the time to look up the addresses of our hotels herself. 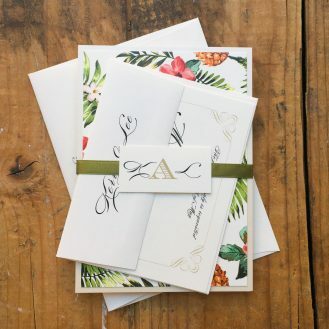 Beacon Lane delivered a quality product and I would absolutely recommend them to anyone looking for an invitation that is personal and unique. Thanks for making this part of my wedding extra special! Kind regards, Lauren"
"Thanks so much for your help Jess! This is an awesome website and you have been so helpful! 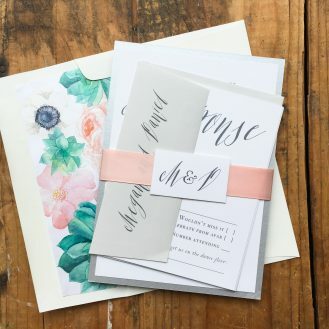 Maggie :)"
"We knew that we wanted to work with Beacon Lane the moment we received my sample invitations, ribbon, and paper. We are over the moon with our wedding invitations and thank you cards. They couldn't have arrived wrapped any prettier! Every step creating the invitations was exciting and so easy. We truly enjoyed working with Beacon Lane through the entire process. Thank you so much Beacon Lane! We've had numerous complements on our wedding invitations. Thank you, thank you, and much appreciation for your hard work, creativity, and designs!! Best, Allison and Drew!" 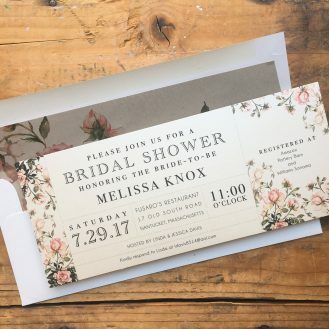 "Just received my invitations (can't believe how fast that was) and am obsessed with them! Turned out so beautifully can't thank you enough!" 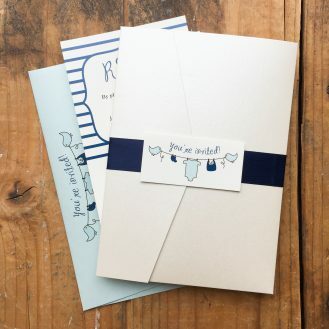 "I absolutely loved the cards! Exactly what I wanted. My fiancé loved them too and commented how unique they were. Thank you so much. -Brittney"
"We absolutely LOVE our invitations! They turned out amazing and the design and colors were exactly what we were looking for. We have gotten so many compliments from our guests on the design, which in turn, makes us super excited for the big day! The process from beginning to end was effortless for us! You and Trevor were so helpful with our questions and proof changes. We couldn't have asked for better invitations! 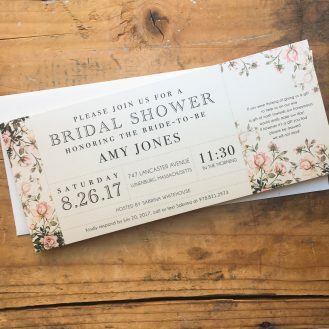 We initially looked at other sites for design ideas, but we wanted something unique and completely customizable to our wedding theme and colors. Something that other sites don't offer. We can honestly say that Beacon Lane captured exactly what we wanted and more! We cannot wait to start the ordering process for our "day of" stationary because we know it'll turn out amazing! -Thank you!!! Caitlin and Aaron"
"The invitations were amzing! They looked beautiful and were exactly what we wanted. It was really hard to find invitations that fit our style but still looked like a wedding invitation but your design was perfect! So far the guests have also loved them. I was really impresed with how accomdating and helpful you guys were. Thanks so very much! -Amanda"
"I LOVE LOVE LOVE them! 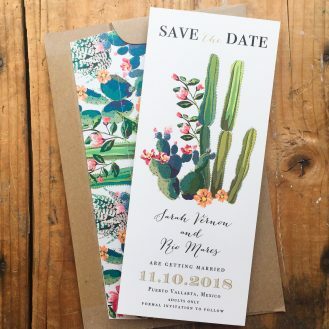 They are basically my wedding in a save the date! Which to me, is perfection ;) Even the packaging was gorgeous & they were received in perfect condition and timely too! Thanks so much for following up, I am very happy with them & cant wait to send them out!" 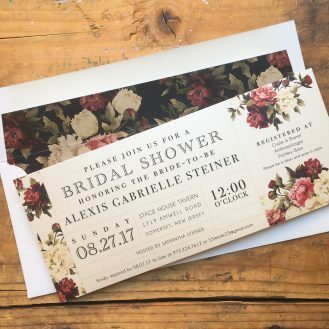 "our guests and us love the bridal shower invitation! It surpassed our expectations with the quality and the process. That is why we purchased the matching wedding invitation. Ordering from Australia can always be a little nerve wrecking not knowing what will arrive, but we absolutely loved them!" "We could not be happier with the whole process. From step one, you were so helpful and made it so personal. We are in love with our invitations, as are our guests. We have gotten so many compliments about how special and personal they are...we are even considering the matching favor tags! Thank you again for everything! 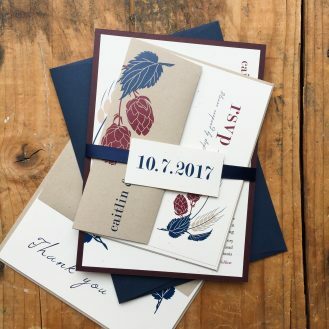 -Colleen & Dan"
"Thank you so much for making my wedding day paper goods! You do such an amazing job! 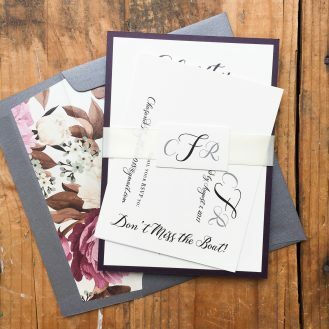 I absolutely love the invitations and I received so many compliments on them! I am so excited to see the rest of the paper goods that will be coming in the mail! It was great working with you." 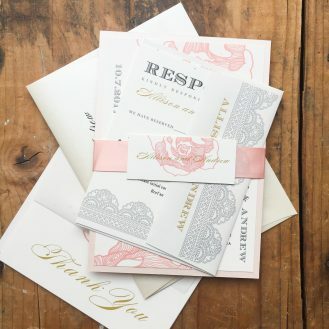 "The invitations were absolutely beautiful!!! We loved them and the guests as well! -Chasity"
"We recently ordered our wedding invitation from you guys and we got so much positive feedback! Our guests loved them! 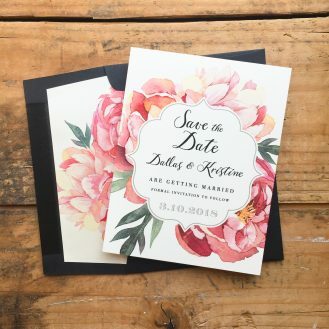 Thanks so much, Kerry"
"My fiancé and I absolutely LOVED our save the dates. The quality, customer service, and experience overall was one of the best I've had. Thank you so much for everything! Thanks again, -Sarah"